The 1.13.2 version requires Forge! I do not have time to support Rift or Fabric. I have a dozen mods and three of them are huge. Looking for Tinkers Construct support? (1.12.2) It has its own mod now (because it makes my development environment explode and deserves a time-out): https://minecraft.curseforge.com/projects/silents-gems-tic-support. But I do strongly encourage you try this mod as it was intended to be played, without Tinkers Construct. Also try Silent Gear: https://minecraft.curseforge.com/projects/silent-gear Full support is still being worked on, but it is usable. This will be required in 1.13.2 if you want tools or armor, as the Gems tool system will be removed. Silent's Gems adds 48 new gemstones to the game! These can be used to craft a variety of building blocks and, more importantly, tools. The tools are highly modular: you can build a single tool out of multiple types of gems (and other things). The stats of such a tool will depend on the parts used. After building a tool, it's appearance can be changed without changing the stats. Many higher tier tools also have special abilities that run on a type of energy called 'Chaos'. Other blocks and items of note include modular armor, lamps, teleporters (powered by Chaos), enchantment tokens (which allow enchanting without randomness, but costing valuable materials), the torch bandolier (stores 1024 torches in a single slot), and more! Tools: Craft a nearly limitless variety of swords, katanas, magic scepters, pickaxes, shovels, axes, and more! Armor: Modular, like tools. Can provide more protection than diamond armor. You can extend the mod even further with these add-ons! You don't NEED them, but they are nice to have. Compatible Minecraft versions are listed, but may be out-of-date. Silent Gear (1.12.2+) - The Silent's Gems tool/armor system reworked and moved to its own mod. In 1.13, this will completely replace Gems tool/armor, but right now both mods have their own system. Gems can be used to make Silent Gear items, but the reverse is not true. Silent's Gems: Extra Parts (1.9-1.12.2) - Make tools out of metals and more. Just in case 48 gemstones aren't enough. This will be obsolete in 1.13, as Silent Gear allows user-defined materials and will support data packs (or something similar). Gemulation by M4thG33k (1.8.9-1.10.2) - Not enough gem stuff in your world? How about gem chests, furnaces, and crafting tables? There's also a block that randomly converts gems into other gems. Tinkers Construct (1.10.2+, requires a separate mod in recent versions) - Yes, there's TiC support now. You can craft TiC tools out of gems if you want to. Extra Parts has also adopted some TiC materials for use with SG tools. Note that some features are not compatible with TiC, such as material grading and enchantment tokens. Silent's Gems will be rewritten for Minecraft 1.13+. This will be a compatibility-breaking update, changing most block/item IDs and removing some outdated parts of the mod. Older versions will not be affected (your 1.12.2 worlds are safe, unless you try to update Minecraft). There are a couple of reasons for this. First, it's a convenient time because 1.13 has some big changes. These are mostly good, but also breaks some tricks that Silent's Gems currently uses (like packing block/item variants into a single IDs). Many things could benefit from a fresh look. Second, the last rewrite was about 2.5 years ago. The code is starting to becoming a mess thanks to the many unplanned additions made in that time. Not to mention that the entire tool/armor system is being moved to a new mod, Silent Gear (currently in beta for 1.12.2). That's a big chunk of the mod, connected to many other components. Rewriting everything would be better than ripping it out and trying to fix the aftermath. TL;DR: Silent's Gems will change a lot in Minecraft 1.13. Older versions will not change. Gems are primarily used to craft tools and armor, but have some other uses. That are 48 in recent versions, divided into three sets of sixteen. By default, all gems in each set are equally likely to spawn in the world. Classic - Found in the overworld, typically at Y=45 and below. Twelve of the sixteen were found in the classic version (1.0.0) of Silent's Gems. Dark - Found in the Nether at most heights, from around lava level to lower ceiling. They are darker in color than classic gems and have slightly different shades. Light - Found in the End at most heights. They are lighter in color than classic gems and have slightly different shades. Added in 2.5.0. Tools and armor can be made of the 48 gems you can find in the world, plus the "supercharged" gems that you can craft, flint, and even more materials if using add-ons. Each material creates items with different durability, mining speed, melee and magic damage, protection and toughness (armor), and enchantability. You can also craft tools and armor with more than one type of material -- simply swap out parts in the recipe for different ones! After being crafted, tools and armor can be repaired by crafting them with additional materials. 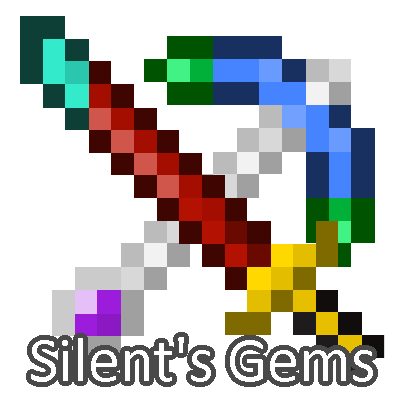 Silent's Gems includes a variety of tools: everything from vanilla and more! Tools that are listed as "super-tier only" can only be crafted by super-tier material by default. You can change craftable tool tiers in the config file. Swords - Mostly like vanilla, but super-tier swords have a magic attack. Dagges - Incredibly fast, but not very powerful. Cheap to craft. Katanas - Faster than swords, but less melee damage and more magic damage. Super-tier only. Less durability than most tools. Machetes - A bit slower and more powerful than swords. More durability than most tools. Breaking plants or leaves with a machete will clear a small area with one swing. It's also somewhat effective as an axe. Scepters - Much slower than swords, low melee damage, but high magic damage. Super-tier only. Less durability than most tools. Tomahawks - Throwing axes. Low melee damage, but a thrown tomahawk can deal a devastating amount of damage, especially if it hits the target's head. They are somewhat effective as an axe. Pickaxes - Similar to vanilla pickaxes, but they work on more materials like glass. They have the Area Miner super skill. Shovels - Mostly identical to vanilla shovels. They have the Area Miner super skill. Repairs are more effective. Axes - Similar to vanilla axes, but they can also break leaves quickly and without taking damage. They have the Lumberjack super skill. Hoes - Mostly identical to vanilla hoes. They have the Row Tiller super skill. Sickles - Capable of clearing plants from a large area with a single swing! They can also harvest crops without breaking the plant. Paxels - A pickaxe, shovel, and axe all-in-one. It can mine basically anything, but is a bit slower than other tools due to its large size. It takes six materials to craft. Repairs are also less effective, but paxels get some extra durability as well. Super-tier only with Area Miner. You should install a mod to view recipe in-game, such as JEI. I won't give exact recipes here. Tools are made as you would expect, except that super-tier (supercharged) tools require higher tier rods instead of sticks/bones. In the base mod, you can use iron rods and ornate gold/silver rods. All rods must match when crafting a tool. Any item that can serve as a rod will have extra info added to its tooltip, including the compatible tool tiers. Armor is crafted differently. You must craft an armor frame, then place four materials (gems, etc.) into the adjacent slots. The tier of the frame must match the materials. Frames are crafted from armor lattice. The lattice is laid out in the same shape as vanilla armor recipes to craft the frames. Again, the lattice tier must match that of the frame you intend to craft. Magic Attacks - All super-tier "swords" (including katanas and scepters) have this ability. To fire, swing the weapon while sneaking. Currently, the system is far from complete. You will eventually be able to customize the attack, but for now it just depends on the sword type. Regular swords fire a gravity-affected projectile that bounces. Katanas fire three shots that trace the ground, damaging anything in there path. Scepters fire five homing shots that target a random nearby entity. Area Miner - Previously an enchantment. This allows super-tier pickaxes and shovels to mine a 3x3 area. Use the "Toggle Special" keybinding (default C) to toggle for each tool. Lumberjack - Previously an enchantment. Trees will fear you, as you can fell them by mining a single block! Use the "Toggle Special" keybinding (default C) to toggle for each tool. Row Tiller - Tills a line of up to 9 blocks. The line can step up/down one block at a time and will stop if it cannot till a block. If you have a block in the slot after a pickaxe, shovel, axe, or paxel, you can right-click with your tool to place it! This also works with the Torch Bandolier. If that slot is not a placeable item, it will check the last slot of your hotbar instead. You can disable or tweak this feature in the config. As of 2.5.0, decorating is mostly removed for tools. The decorating recipe still exists mostly for repairing. You can still change the appearance of the tool head by placing a material above the tool, but tool heads no longer have multiple segments. For tools with ornate rods, place a material below it to fit the gem into the rod's deco slot. Place materials into any other slot to just use it for repairs. Legacy instructions: Place a tool or piece of armor in a crafting grid. Then place materials in slots around it. This will exchange part of the tool/armor with that material, changing its appearance. You can also place a block of wool in any slot to add a cosmetic grip on the tool rod (does not work on armor). Decorating a tool or armor also repairs it, making it a good way to keep your best items alive! Flint can also be used for decorating, but will only repair flint tools/armor! Use glass to restore a part to its original state. Decorating can also repair a broken tool. Hover over a tool or armor piece and press Ctrl to see its stats. This includes durability, mining speed, harvest level, etc. Press Alt to see information on the tool's construction and statistics. Construction is what the tool was originally made of and statistics tracks some random things like blocks mined and mobs killed. All the parts of a tool or piece of armor need not be the exact same item. As long as they are the same tier, you can mix materials. This will average out the stats of the parts, but also gives a "variety bonus". The variety bonus is small, so it may not always give better stats. Experiment to see what works! In this example, the Black Diamond makes up for Lepidolite's low durability, at the cost of some magic damage. Tool parts refers to items that can be used to craft tools and armor. This includes gems, for example. If using Extra Parts, many common ingots are as well. Technically, tool rods are also parts! Each part has a 'tier' assigned to it. When crafting a tool or armor, the tier of each part must match! The tier of the tool is also determined by the parts it was crafted with. Decorating with parts of a different tier will work, but may not repair the tool. Tool parts will also have information added to their tooltips, such as their tier and stats. Mundane: Common materials, like flint. Regular: Uncommon materials, like gems. Super: Rare materials, like supercharged gems, which must be crafted. Many tool parts can also be graded in the Material Grader. This will assign a random grade (or ranking) to the part. Possible grades (lowest to highest) are: E, D, C, B, A, S, SS, SSS, with 'B' being the most common. Grades are normally distributed (bell curve), meaning both high and low grades are less common. As stated above, the Material Graded grades tool parts. It no longer requires Chaos to function, but will run much faster if it has some. Items can be piped into the top or sides and out the bottom. The supercharger is a block that can enhance Silent Gear materials. It does not work with the tool/armor system in Silent's Gems. Please see the wiki page for full details on setup and usage. These change the harvest (or mining) level of the tool and boosts its durability. For example, apply an iron-tipped upgrade to a flint pickaxe to mine gems, diamonds, etc. Apply a diamond-tipped upgrade to mine chaos ore and obsidian. You can completely bypass vanilla tools! Tired of making mob grinders and hoping you'll get the enchantments you want? Why not just invest your mineral assets into enchanting instead? With enchantment tokens, you can have exactly what you want, for the right price! They should also work with tools from most other mods (no, they don't work with Tinker's Construct!) Of course, you can still use enchantment tables if you like. How to use: Craft the enchantment tokens you want (you'll get one level of the enchantment per token), then craft the tokens with a tool. You can craft multiple tokens with a tool at one time, just put one token in each slot. Normal enchanting rules apply. Keep in mind that enchantment tables won't work on something that is already enchanted, but tokens will. Tool souls are a new upgrade system for tools and armor. Souls have their own experience system and will level up with use (mining, fighting, etc.) Currently they are incomplete, but usable. They are only craftable in version 2.6.0 and higher. A tool soul will have one or two (usually two) elements, depending on the soul gems used to craft it. Both elements add some basic stat modifiers and affect what skills can be learned. The primary (or first) element has a greater effect than the secondary one on both stats and skills. The main crafting component for tool souls. Soul gems have one or two elements that determine the elements and properties of tool souls. Most soul gems drop from various mobs (hostile and passive). Some drop when you harvest crops. Soul skills are abilities that tool souls will learn as they level up, one skill per level. The skill selected each level is somewhat random, but different elements will make some skills more or less likely to be learned. Some skills are also locked to certain elements. Skills have a variety of effects. Some just increase stats. Many have passive effects that activate in certain situations. Some can be activated manually. Refer to the in-game manual for details on skills. Somewhat like reusable potions, but they can also be used to fly! You can have up to three effects on a single gem, by default. In 2.2.0 and higher, effects use a certain number of slots, with each Chaos Gem having 20 slots total. While active, they will drain their charge and apply the appropriate effects. If they run out of charge, they will be disabled, removing any effects immediately. Chaos gems must be charged with Chaos. This can be done either by placing them in a Chaos Altar (fastest way) or by just standing near nodes or pylons. They will no longer regenerate charge on their own, unless you add Recharge runes. Base max charge is two million and can be increased with Capacity runes. Chaos Runes determine what effects a Chaos Gem will have. Each rune has a certain number of slots used and Chaos cost. For levels beyond one, only one extra slot is used. Chaos cost also increases slightly with the level. Beneficial potions - Runes exist for most vanilla potion effects and some others. These apply the potion effect will the chaos gem is active and the effects will be removed as soon as it is disabled. Negative potions - Why would you want negative effects, you ask? They have negative slot costs, meaning they free up slots for other effects. Flight - Grants creative flight and negates all fall damage while active. Additionally, it will not drain any charge when you are grounded! But a small amount of charge is consumed when falling at dangerous speeds. If you have a flight chaos gem, I recommend keeping it enabled at all times and land to save charge. Capacity - Increases Chaos capacity by one million. Max level of 4. Recharge - Causes the chaos gem to generate Chaos on its own, but only when not draining charge. Max level of 4. Want to get around faster? Silent's Gems has some modestly priced teleporters to use! There are three kinds: regular, redstone, and anchors. These teleporters are somewhat "dumb". They don't actually care if another teleporter exists at the destination, but you need two teleporters to set the destination. Recipes can be disabled in the config file. Place any combination of teleporters you wish (even anchors). Use a Teleporter Linker to connect pairs. You can link any of the three types together however you wish! Note that there are no actual "links" between the teleporters. The linker merely tells the teleporters where to send things. Try using anchors to establish one-way connections. In Silent's Gems 2, teleporters require Chaos to run. They can draw it directly from the player, or can be powered by nodes or pylons. Earlier versions of the mod require XP. Short distances are free, longer distances require linearly increasing amounts of XP, and traveling between dimensions has a flat cost. Regular - Can teleport players that right-click on them. Redstone - In addition to the functions of the regular teleporters, these can be triggered by a redstone pulse. They can also teleport non-player entities! Teleporting non-player entities across dimensions is currently a bit broken, I don't recommend it. Anchors - Not capable of teleporting anything, but the other teleporter types can link to it. Also much cheaper! Chaos is a magic energy produced by Nodes and Pylons. The player has a small internal buffer of Chaos. To hold more, you'll need a Chaos Orb. The Altar can store Chaos and charge items. An early way of gettings Chaos. These blocks spawn naturally in the world. They don't produce much, and send it infrequently. Nodes do have an interesting property however: they send a variety of "packets", not just Chaos packets. These packets do different things, including repairing damaged items and attacking hostile mobs. One disadvantage of Nodes is that they aren't easy to move. They can't be broken; you need an expensive Node Mover item instead. Still, building your starter house near a Node could be useful. A faster way to get Chaos than Nodes. They can be crafted and placed anywhere you need them. They send Chaos in "packets" just like Nodes. But they ONLY send Chaos packets, none of the special ones that Nodes do. The player's internal Chaos storage is a bit limited. To do much with it, you will need to carry a Chaos Orb with you. Chaos Orbs will automatically accept Chaos from any source the player can, such as Nodes or Pylons. In other words, stand near a Node or Pylon. You can also charge Orbs in an Altar. The different tiers of Chaos Orbs vary in more than capacity. Many have a chance of taking damage and eventually breaking when Chaos is drained from them when they are low on charge. If possible, keep your Orbs above half charge to avoid damaging them. The Chaos Altar can accept Chaos from nearby Nodes and Pylons. It will store a fairly large amount. Place items that can store Chaos in the Altar to charge them without needing to stand near a Chaos source. Altars also provide a transmutation system. Currently there are only a couple of recipes, which can be viewed in JEI. These include duplicating chaos essence and converting gems between different sets. All transmutations use Chaos and require a catalyst. The item in the catalyst slot is never consumed! Glowroses are light-emitting flowers that spawn naturally throughout the world. Their light is enough to prevent mob spawns just two blocks away. Spawn rates are configurable. In 1.13.2, glowroses can be planted in vanilla flower pots. Glowroses can't be planted in normal flower pots, but the Chaos Flower Pot is designed to hold them. Not only that, it greatly amplifies the light of the glowrose! A potted glowrose will also place phantom light blocks a good distance away, lighting up a large area. Note that your game may slow down a bit after placing a Chaos Flower Pot, but should return to normal in less than a minute. Life Steal - The user is healed for a small fraction of the damage they deal. Mostly just for melee, but it works with thrown tomahawks too! Ice Aspect - Swords enchanted with Ice Aspect will chill the target, slowing or immobilizing them for a short time. The target also takes "cold" damage over time while chilled. Mobs naturally immune to fire will take extra damage. Lightning Aspect - Swords enchanted with Lightning Aspect will electrify the target, weakening them and dealing damage over time. The electric charge can also jump to other nearby mobs, although with reduced intensity. Good for crowd control, but you might want to be careful with this one. Concentration - Increases magic damage dealt by the weapon. The math is identical to the Sharpness enchantment. Cannot be applied with other damage-boosting enchantments. Gravity - Reduces or completely eliminates (depending on level) the speed penalty for harvesting blocks while flying or underwater. Return Home Charm - Right-click on a teleporter (anchors are fine) to bind it to that point. To teleport, hold right-click for a certain amount of time (24 ticks by default), then release! In Gems 2, it requires Chaos to function. Earlier versions use durability. Torch Bandolier - It stores 1024 torches. Because I like caving. Right-click to place torches. It absorbs torches from your inventory on its own if auto-fill mode is enabled. Sneak and right-click to toggle auto-fill mode. Sneak and left-click (preferably in the air) to extract a stack of torches. Holding Gem - Functions identically to the torch bandolier, except you can set it to store/place any block and it stores a larger amount. Simply craft the block you wish to set with an empty holding gem. You can change the set block later, but the holding gem must be empty! Summon Kitty/Summon Puppy - Spawns a tamed cat/dog. You can also name it in an anvil, just like spawn eggs. Fluffy Puffs - A cotton-like plant used to craft soft things. Get the seeds by breaking tall grass, just like wheat seeds. Plant them to grow fluffy puffs, then use them to craft wool, string, feathers, fluffy fabric, or fluffy blocks. Fluffy Blocks will reduce/negate fall damage when you land on them, depending on how many are stacked below the topmost. If I reload the client, I will get my energy bar and I can shoot the magic ball things from my katana. Then, a few minutes in, that bar disappears abd it won't work at all. Fully charged with an orb on charge mode, standing by a charging crystal, its just not working at all. Any ideas? I'm sure it's probably some kind of a conflict with another mod or something. anyway to disable grow flower light? On Minecraft 1.13.2? I guess that fix didn't make it into 3.0.9. It should be fixed next version. Seems to be working on 1.12.2. The option does require a game restart to take effect. You may also need to update existing blocks (break and replace). just try that with only this mod and still don't work grow rose still emit light . Hi, I'm making a resource pack that covers your mod's textures. Should I just ignore anything whose texture is just TODO in each release? Maybe? Depending on the block/item, there is a chance the model would change to point to different texture files. But you won't break anything by overriding them. Also, please send me a link when you are finished, if you don't mind. I'd love to see what you have created! I've just realized that all the armor textures are recolors of temparmor. Works with me, but I'm having a bit of trouble figuring out which parts of it do what. Some of them seem to be overlays, and parts of it are transparent in GIMP. Could you give me a layout guide explaining what each part is? I can tell what parts are limbs, chest, helmet, and legs, but the transparent parts are confusing me. Thanks! Figured it out, I colored each part of temparmor and loaded the game to figure out what does what. Not too much longer and I'll have something nice to show off! Here is a link to the WIP project. 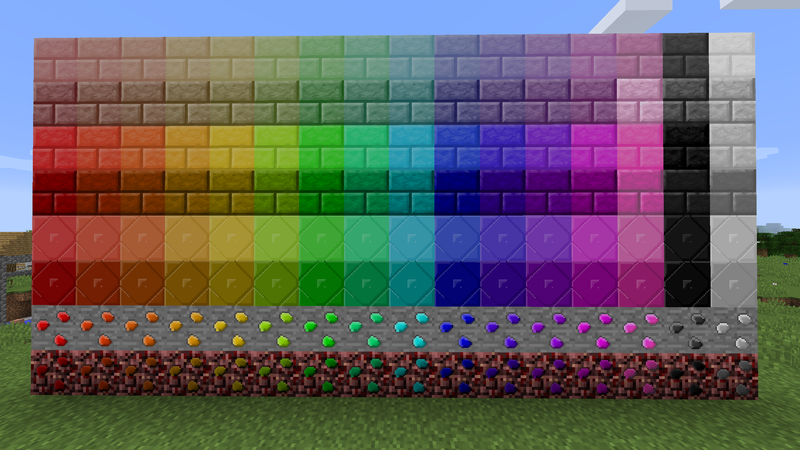 I have a ways to go, but the gem blocks, ores, gems, super gems, chaos gems, and armor are looking ready. I found another forum member who was working on their own resource pack for this mod, so we are gonna start working together and get through more of it. The plan is to finish the 1.12 version and then back porting textures will go quickly. I'll contact you again when everything is ready! Gosh I feel annoying for commenting so much.. lol How would I be able to craft a Chaos Altar? Chaos Ore only gives me Chaos crystals, and I can’t figure out how to craft a Chaos orb. Neither are available in 1.13.2 yet. The chaos altar is most likely coming back, orbs probably are. Chaos has completely changed: it's more like a "pollution" system than an energy system. Anything that previously consumed chaos will "just work". The only place this is mentioned right now is in the changelog here. I'll write a proper wiki page later on when it's closer to finished. Right now, the effects of chaos shouldn't cause much trouble. Ah, I understand. But either I’m doing something wrong, or something is wrong with the stations like the supercharger because they’re not working. It says “Chaos: None” at the top. Even with the Super Charging Agent in place nothing happens. Is this an issue, or does this work for you and I’m just doing something wrong? This might be the bug I just discovered today (ornate gold/silver rods contain an error in their part files), but you didn't provide enough information to work with. In the future, please use the issue tracker and make sure to include a crash report. You can go ahead and report this to be sure, or just wait for 3.0.6 to release and see if the issue is fixed. Thank you for getting back to me so quickly! I placed a report in the issue tracker along with the crash logs. Thank you for informing me of the issue tracker, I didn't know there was one! And thank you for your time! Love your mod. Currently running SilentsGems-1.12.2-2.8.15+316. Was wondering if there is away to disable the skill Tag? I believe that is the one that turns the mobs or players white and you can see them thru walls? It seems that the only way to remove it when applied to a player is to die atm.